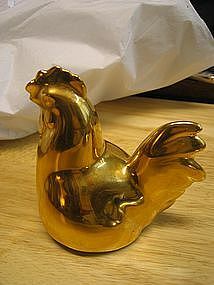 Replacement lid to a hen or chicken dish or box. The interior is white. It is approximately 3 1/4 inches in height, 3 7/8 inches in length and 2 3/4 inches in width. It has no chips, cracks, breaks or rough rim, but shows minor finish wear. I need your zip code to calculate the postage. 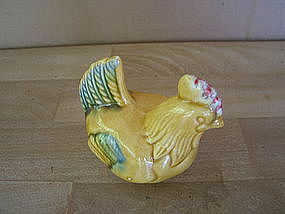 Vintage porcelain hen figurine measuring 3 x 2 1/2 x 2 inches. There is wear to the finish. I need your zip code to calculate the postage.